Bognor was in the parish of Pagham and thus in the Archbishop of Canterbury’s peculiar. 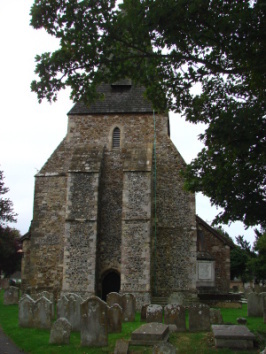 There was a chapelry at South Bersted, which was consecrated when it acquired burial rights in 1405 and was fully parochial by 1465 (VCH 4 p226). In the late C18, Sir Richard Hotham, a wealthy London merchant, planned a resort near South Bersted, initially named ‘Hothampton’. It had little success and the first major development was at Bognor on the sea, where in 1821 a proprietary chapel, later St John the Baptist, Steyne, was built. When in 1873 Bognor become a parish, this was initially used, until replaced by a new church with the same dedication in 1882. Like its predecessor this no longer exists, so the only church in the resort area is St Wilfrid of 1908. Initially a chapelry of St John the Baptist, it dates from the period of Bognor’s most rapid development, culminating in King George V’s convalescence in 1929, when he granted it the suffix ‘Regis’. South Bersted today lies within the town and as early as 1894 the parish erected a chapel at North Bersted, now Holy Cross, as housing was built along the main road towards Chichester.